When Sun Jifa lost his arms in an accident, he couldn't believe how expensive hospital-supplied artificial limbs were. So he went with a cheaper set, and was flabbergasted at how useless they were. This prompted him to do what few could ever conceive of doing. He set about creating his own by cobbling together parts. 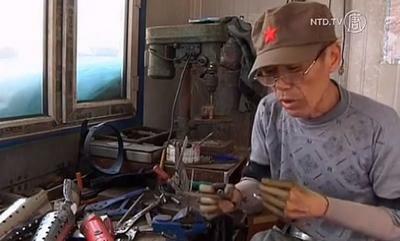 For eight years, Sun worked on his set of prosthetics, tweaking them at his home in China's northern Jilin province. They're the pair he now wears today. But these are anything but dummies — the homemade bionic arms allow the 53-year-old to drive his vehicle, light a cigarette and even pick up tools and utensils. And they cost less than $500, which is merely a fraction of what the hospital charges. This has created demand and turned him into something of a local celebrity. To date, Sun has sold approximately 1,000 of these to other people in need of low-cost, high-functioning artificial arms or hands. If that was all there was to this story, it would be inspiring enough. But Sun is no hardware developer or engineer, nor does he have any medical training or anatomical expertise. He is a farmer, and the accident that claimed his arms was the premature detonation of fishing explosives. In other words, you're looking at a man who simply figured out how to create bionic limbs with no formal technical training whatsoever. Sun explains how they work: "[The left arm] transfers power from the natural movement of my elbow into the finger, allowing it to grab and hold… rotating the two bones that I have left in this arm allows my right hand to open and close." His prosthetics may seem rough around the edges compared to the advanced technologies available today, but they're still very impressive. Not only can Sun operate farm equipment and handle chores, but he can also handle the brand-new prosthetics business he has created to support his family and help other amputees. It's amazing what can happen when great need meets even greater ingenuity and tenacity. And it's an important learning lesson for anyone who has ever felt that they don't have the right training, opportunities, age, cash flow or ____ (fill in the blank) to make miracles happen. For more, check out Sun's story courtesy of NTD.